TEXO®, a prestressed textile panel, is a structural system patented by Tensoforma based on the use of a specific aluminium extruded profile frame and a silicon elastomer positioned between the aluminium extruded profile frame and a textile membrane. Modular panels can therefore be obtained which are uniformly prestressed (elastoplastic behaviour of the elastomer) along the perimeter, provided with further elongation capabilities to absorb further stressing loads (wind) and with a guarantee of constant maintenance of original prestress over time, whatever the elongations or reductions of the textile material which are offset by the action of the silicon elastomer. The Texo60 panel consists of a square profile (60mm size) in 6060 T5 aluminium subject to chemical anodizing treatment, 15 micron thickness, complete with “binocular shaped” angular joints in anodized 6060 T5 extruded profile. The angular detail is completed by three shaped aluminium plates, 5mm thick. With respect to the specific system of angular joints, the panel is assembled by means of a specific machine with hydraulic jacks to achieve the exact prestress value of the textile membrane. Prestressing turns the membrane into a structural and stiff element. Once the frame has been assembled and prestressed, it is completed by means of an L-shaped 6060 T5 aluminium extruded profile, also anodized, as a finish. 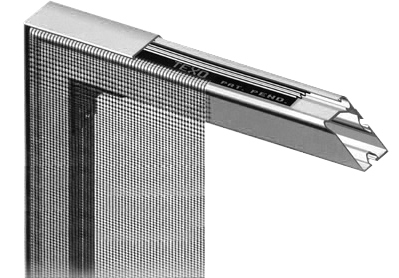 The main square profile features two grooves (triangular channels) to include shaped aluminium elements to fix panel supporting plates for connecting to the understructure. The system is currently applied as a sunscreen (combination of textile panel with glass or protection of matt surfaces with subsequent reduction of surface thermal load), as part of architectural refurbishment projects (changing the surface of the façade), and as an actual envelope (with excellent performance in terms of water and air tightness and heat resistance). TEXO represents an innovative, versatile and highly performance envelope system that can be used for new constructions and for refurbishing buildings. TEXO panels are included in a system of uprights and cross-beams and the restraint is ensured by a series of suspension hooks. The façade system is in turn connected with the building by means of brackets. Water tightness is ensured by a system of seals. Panel sizes are not standard but are manufactured individually to match the features of the project: the only limitation is the possibility of transportation. Therefore, using ordinary means of transport, maximum size is 12.5m x 2.5m height per panel. The multiple uses of the TEXO® system refer to the large availability of technical textiles now present in the international marketplace. The system, originally conceived and developed for outdoor applications, is presently used also for many indoor applications. Micro-perforated textiles, nets and highly translucent solid fabrics are used, including those for rear projections, with the possibility of four colour digital print, as well as fabrics with sound insulating features, especially indoors, and last but not least, photovoltaic fabrics. From a technical viewpoint, the most widely used fabrics are those with high-resistant polyester support, fibreglass fabrics. As to coatings, in addition to polyvinyl chloride, opportunities offered by silicon and PTFE (Teflon) lead to very high levels of performance. In terms of technical eligibility for its use in façades, the system is certified by Avis tecnique 2/07-1273 issued in France by CSTB (Centre Scientifique et Technique du Bâtiment – Scientific and Technical Centre for Building - ENVELOPPE ET REVETEMENTS Department, Paris).